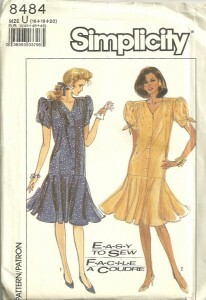 Simplicity 8484 was copyrighted in 1988 which is when, I think, I first made this dress in a Lemon & Grey abstract print crepe de chine. I remember it as being ultra-smart and comfortable to wear so was delighted when it came up on eBay in the right size range. It has taken a lot of communication to receive the pattern as initially the seller sent the completely wrong pattern! 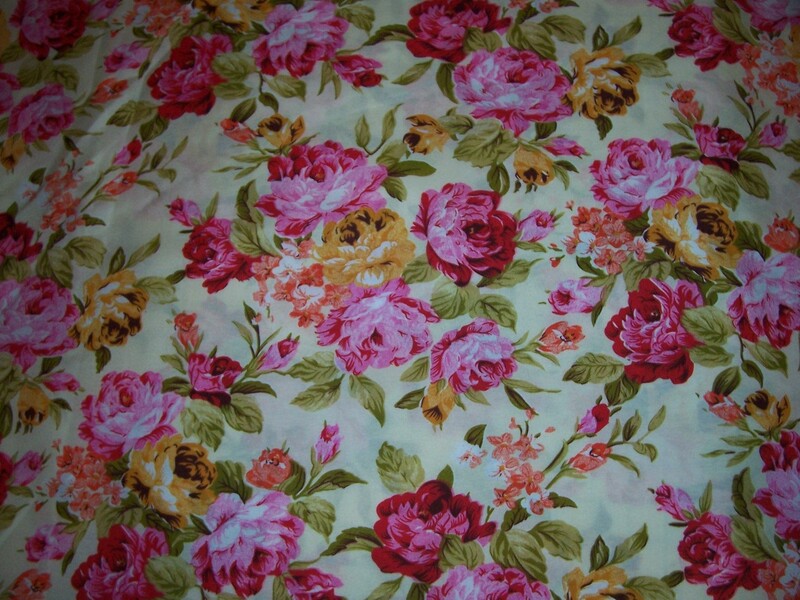 Now it is here I plan to make in a lightweight cotton print – just as a tester on sizing and fit. Bearing in mind the really puffy sleeves on the previous dress, I shall re-draft the sleeves so that they have only a small puff at the shoulder, but will keep the tie feature. The dress takes roughly 4 metres of 114 cm fabric and as this is the usual amount that I buy “on spec” I should be able to find something to use. It seems to be the way of things at the moment, never straightforward. I had adjusted the pattern for this dress by dropping the fullness of the bust to my new bust point and adding to the seam allowances at side and panel seams. I had measured myself (as I know I have put on weight, again – how depressing) and wanted to be sure that the dress was big enough. 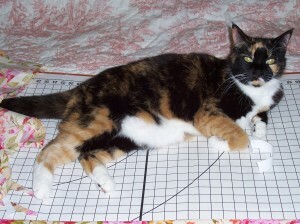 Having basted the dress together I discovered that I did not need all those extra inches! So… the dress took longer to make than I had envisaged. It is finished now and waiting for some Spring-like weather in which to wear it. When I do finally wear the dress I will get some photos taken as the style really does not have a great deal of “hanger appeal” – it looks so much better on a real live body! 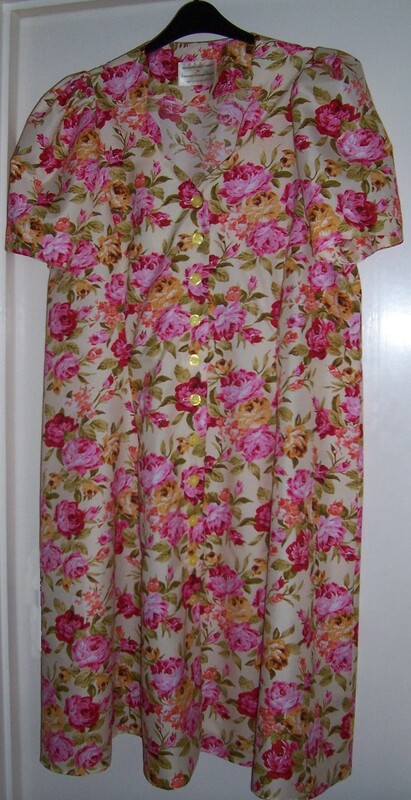 It’s the first day of Spring so I thought I would make a new dress in a cotton fabric that has a print that made me think of the Pink Hyacinths and Yellow Primroses currently flowering in the garden. I bought the fabric last Autumn from a stand at the Quilt Show held at the Bath & West Showground, Shepton Mallett. 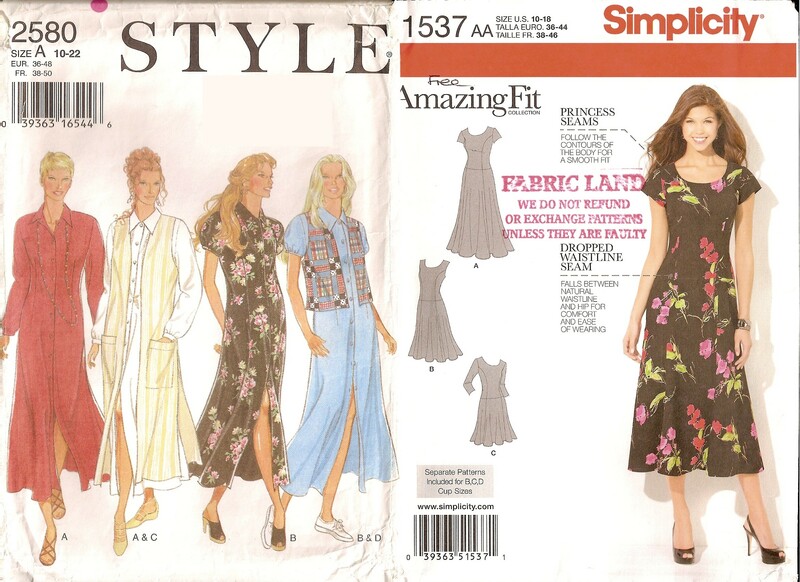 Whilst I am waiting for a new pattern ordered from eBay to arrive, I decided to re-visit an old pattern (New Look 6527) that I have used in the past with great success. When made up the sleeves are not quite as full as portrayed on the pattern envelope and of course, my waist is no longer as pronounced but I do like the full skirt, scallop neckline and the button front. I have made some fitting adjustments and cut out the fabric so hopefully will put the dress together over the weekend. Whilst cutting out the pattern, I was supervised by a furry assistant – Jazz, my Tortie & White cat who has delusions of becoming a dress designer! At last, I have finally finished this dress. It took quite a bit of adjustment on the fitting as my shape has definitely changed as I have got older! However, I am very pleased with the final result. 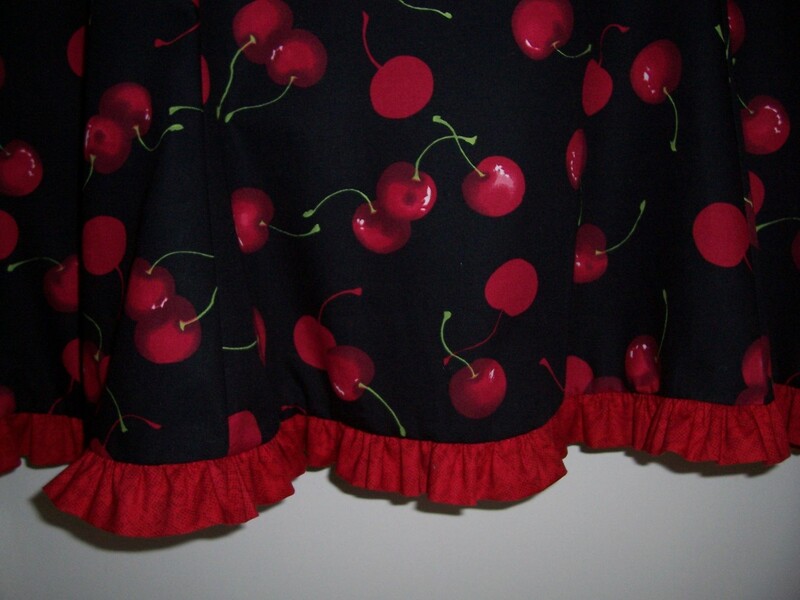 As the skirt is “flippy” I decided to add a narrow gathered frill in contrasting Red to ensure that the hemline stayed out fully and obviated the need for a frilled net petticoat. 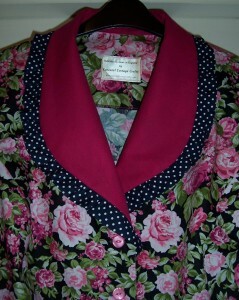 The puffed sleeves turned out well and fitted neatly into the armholes. Although I adjusted for my sway back and inserted a lapped zip into the centre back seam, because of the neckline shaping this dress goes on “pullover” style and the zip is not actually needed. As soon as I get the opportunity I will have a photo of me in the dress wearing those fabulous Cherry-print shoes! 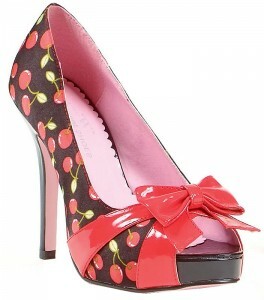 In the hope that the cherry-print dress turns out well, I am currently lusting after these shoes to wear with it. What do you think? 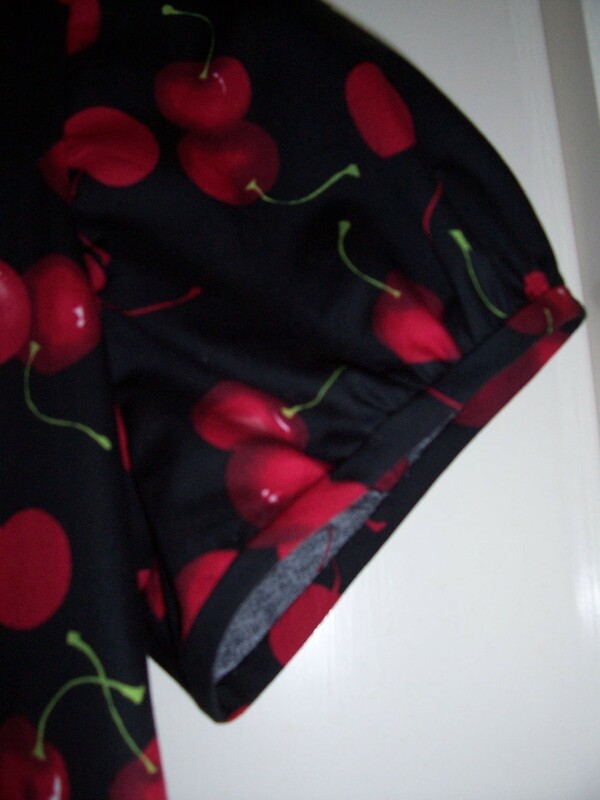 Using a dramatic Cherry print cotton purchased from Fabricland in Salisbury I have cut out a new style (for me) of dress. 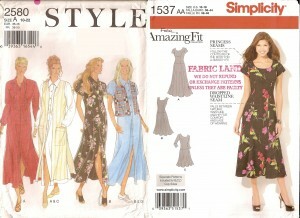 I have used Simplicity 1537 view B and added short puffed sleeves from Style 2580. 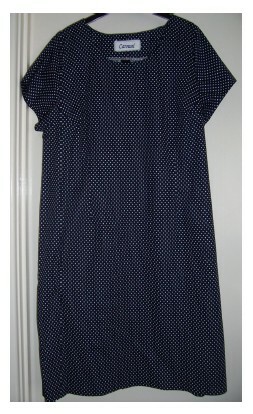 I have made Style 2580 shirtwaister dress before (a long time ago) but the Simplicity pattern is a new one for me. I changed the sleeves as I am not fond of cap sleeves and I don’t think they do anything for me! 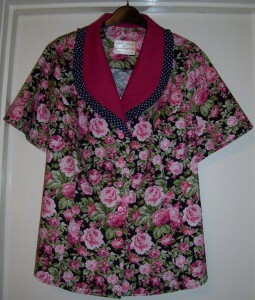 You may recognise the prints used for this blouse all of which were purchased from Fabricland. I still had some leftover Cerise Cotton and the Navy pin spot Cotton. 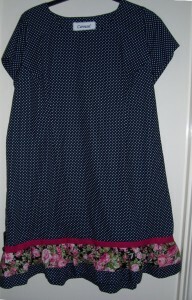 As I thought the frill on the Shift Dress looks so good I decided to repeat the combination for my usual blouse. This time I made a note of how long it took to cut out and stitch the blouse. A total of 4 hours which I think is good but not nearly quick enough when you recall the timings allowed for those stalwart competitors in The Great British Sewing Bee! I think the competitors are all great and I admire their enthusiasm and confidence not only for entering the Sewing Bee but also their persistence in sewing “outside their comfort zone”. 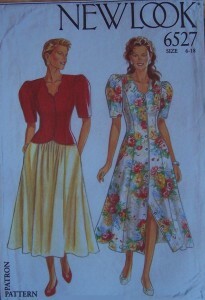 So the next project that I sew will be a NEW pattern in a totally different style to my recent productions. 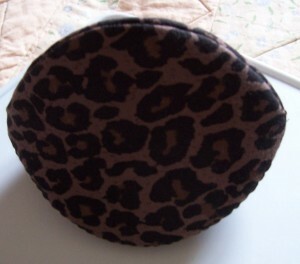 From some of the scraps of leftover Leopard print jersey I have made this medium-sized clamshell pocket for a friend – she just loves Leopard print! Back in the day when I was much younger (and slimmer!) I made this dress in a Leopard print jersey fabric. It got sold on eBay and now has a new life in someone else’s wardrobe. 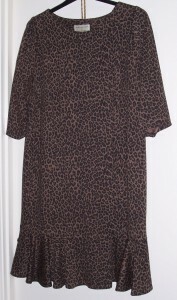 However as I love the style and fancied re-visiting the Leopard print here is version 44 of my favourite dress pattern. 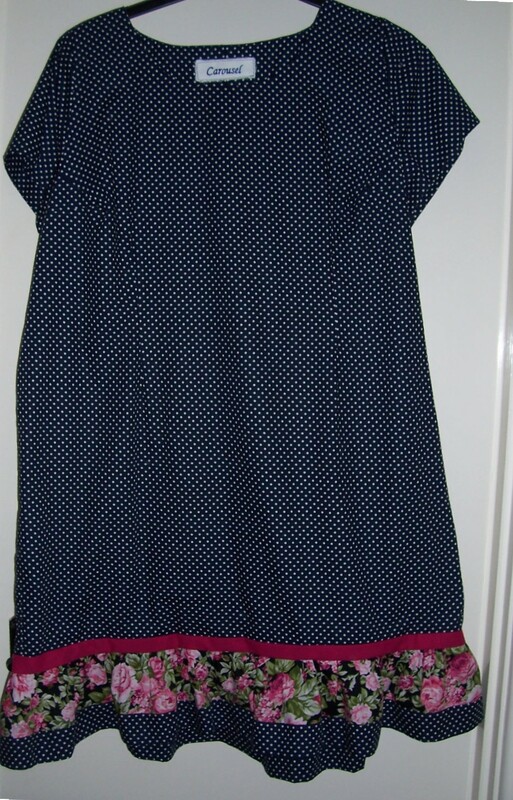 I have re-positioned the bust and body darts and added a bias frill at the hem which I copied from a skirt pattern. I love this style hence it has been made up so many times! The original design from the magazine had very short cap sleeves and I have drafted 3/4 sleeves which are more forgiving on us “older” ladies. 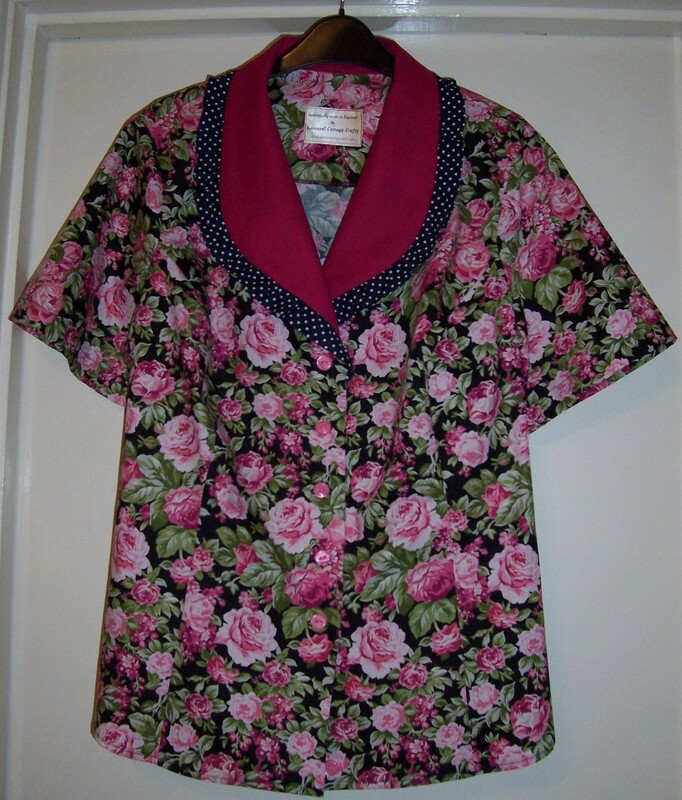 I also re-drafted the neckline to give a slightly deeper scoop at the front than on the original pattern. 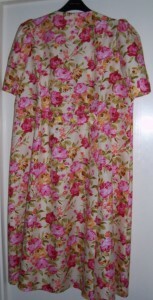 As there is some stretch in the fabric and I have cut with a generous amount of “ease” this dress is pullover style. 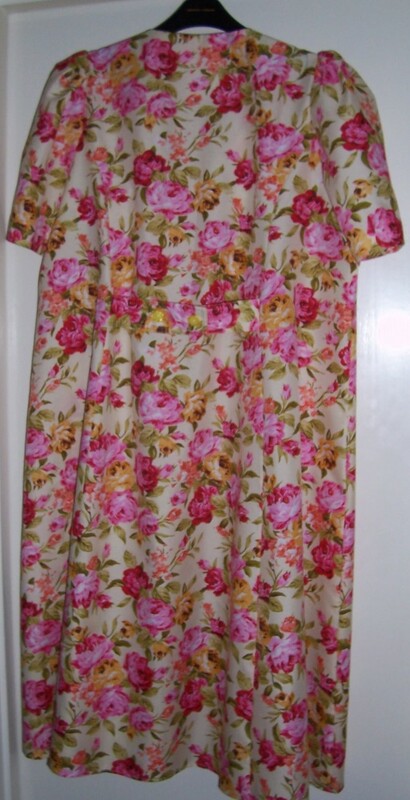 Although not absolutely necessary as jersey fabric does not fray, I did overlock all the seams so now the dress is as good on the inside as it is on the outside. With no zip the “making up” time is reduced and I can have a new dress soooo much quicker! Although we are now in March and fast approaching the Spring equinox the weather is not very spring-like so I shall be able to wear this dress with Black opaque tights for a few outings before putting away in the “Autumn” clothes storage box. 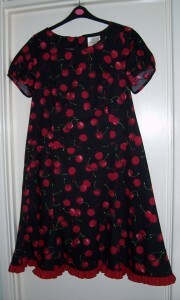 I made this dress up in April last year but when finished I discovered that it was too short! 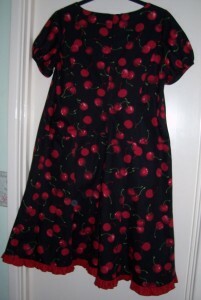 Since then it has been hanging in my wardrobe awaiting an alteration. As my sewing friends know very well, I dislike alterations. I would much rather make an entirely new garment than set to and unpick something that I have already made and as for ready-made, well that is just a no-brainer! However, I had the fabric and the machines were all threaded up with Charcoal thread so I decided to bite the bullet and do something about the length of this dress. I took down the minute hem and stitched up the vent at the centre back then decided on what fabrics to use for the frill and in what combination. 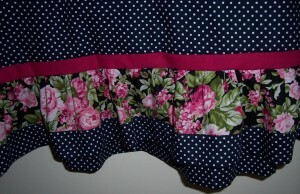 Here are photographs of the before and after together with a close-up of the frill. What do you think?